Sara had planned to take me to see the much anticipated World War Z for our anniversary, but our plans were ruined by a little unexpected mishap, so I’m just now getting around to seeing it. Sara and I don’t get to see a lot of movies in the theater. In fact, the last time we saw a movie was actually January 2012. And actually, when we watch movies at home we have to move the couch close enough to be able to see the screen on our tiny tv. So keep in mind that the enormous, high-definition screen and hyper-realistic sound system kind of seem like magic to me, and that probably colors my experience just a little bit. First off, I loved the book and I was really looking forward to the movie. It turns out that, aside from the title, there is literally no other connection between the book and the movie. Not a one. No characters, plot, scenarios, nothing. That’s kind of a shame, because I think the book would have made a really cool movie. The book is much more documentary-style vignettes as the zombie apocalypse sweeps across the world, which would have been a really unique look and feel. That being said, I LOVED this movie! So good. The beginning (always the best part of any zombie movie) very skillfully built the tension and kept it high. Despite having watched many, many zombie movies, my heart was pounding and I was totally sucked in. The middle was great. It swept across the world and showed reactions in so many different ways, being very epic in a way most zombie movies never attempt to be. And finally, the ending was plausible and very satisfying in a way that I didn’t necessarily expect. Like I said, I loved it. And the whole way home I was eyeing up both people and dark alleys suspiciously. I knew going in that the movie was nothing like the book, and I’m sure that helped me enjoy it. Instead of sitting there comparing them, I tried to pretend this was an entirely different zombie movie altogether, and it worked. And honestly, it’s probably better that they didn’t try to include more from the book, because if you have just a few things it only highlights the discrepancies. 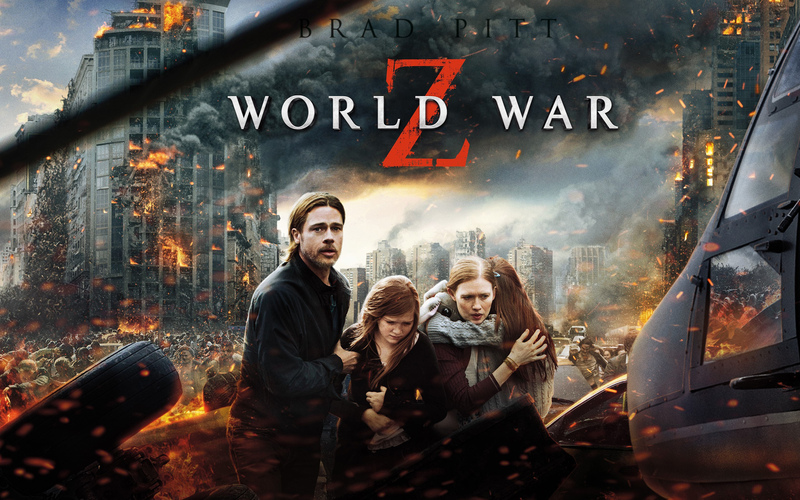 Why they decided to use the name “World War Z” instead of just making it unrelated I guess we’ll never know, but I can enjoy them both for their own merits. My all time favorite zombie movie is the Dawn of the Dead remake from 2004. World War Z ranked right up there with it. I don’t think there was enough that was really “new” to unseat Dawn of the Dead, but honestly, that’s probably more a product of the timing. If I had seen this movie first and Dawn of the Dead 8 years later, I probably would have liked this more. “Fast zombies” were still new when Dawn of the Dead came out (remember, 28 Days Later had only come out 2 years before), and the whole concept just seemed so fresh and awesome. However, World War Z is a modern movie with top notch production and the special effects, acting, and just general craft of the movie are very well done, meaning that cinematically speaking it’s probably the superior movie, just not as groundbreaking. However, I do have to give them a little bit of credit here. World War Z is not gory. A non-gory zombie movie! Zombie movies are specifically designed to gross you out with as much disgusting blood and guts as possible, but they managed to maintain the tension and terror without it, implying it and doing most of it off-screen. Superbly done! I wouldn’t have thought it possible if I hadn’t just seen it. In fact, they do it so well, that I didn’t even notice it wasn’t gory until halfway through the movie. So, World War Z, highly recommended, both the book and the movie (since they are two entirely different things).